At Big Rock Glass, we are committed to providing superior service, product and quality in a timely fashion. We are dedicated to developing longterm relationships with our customers. We are committed to a safe work environment with an atmosphere of honesty and fairness. Since 2002, Big Rock Glass owners, Herb and Susan Schaller, have been making a difference in the southern Alberta glass industry. With over 40 years of personal experience in the glass business, Herb can offer quality choices, custom options and timely service. Big Rock Glass offers a wide range of commercial, automotive and residential products and services including store fronts and glazing, windshields for all automotive makes and models as well as varied residential glass options such as custom shower doors, sealed unit replacements, new windows and doors. 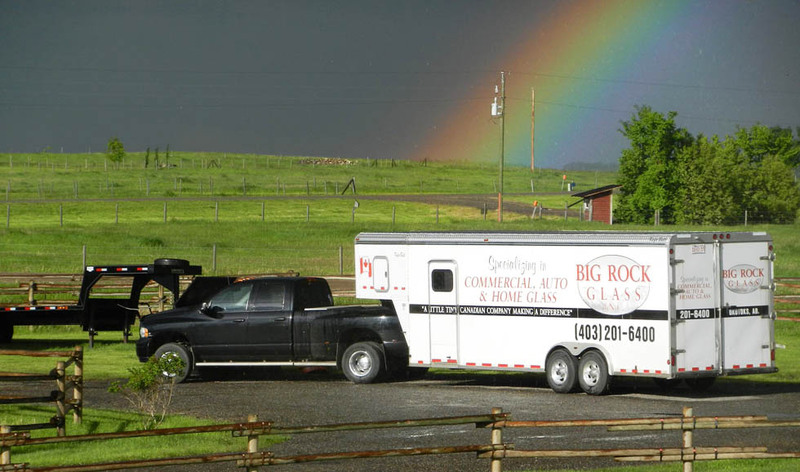 Located just south of Calgary, Big Rock Glass serves Calgary, Okotoks and areas across southern Alberta. Contact us today for all your glass needs. Big Rock Glass - A little tiny Canadian company making a difference. Contact © 2018 Big Rock Glass. All rights Reserved.